Teddy made this lovely creation after school. It was part of the district's anemic after-school enrichment program. There was apparently some structural engineering involved, as one teacher walked around with a hammer stress-testing the edifices. Teddy's friend's roof cracked from the blow, so she gave up and turned hers into a Flintstone model from the stone ages. So, we tackled it after dinner the other night. I'm not a huge fan of gingerbread...especially days old stale gingerbread with cement-hard icing. Such delicate sensibilities did not affect DH, Teddy, or Barley from enjoying the spoils. 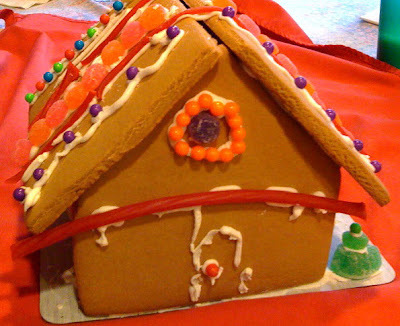 We're building gingerbread houses in the second grader's class Friday. The thought of having to eat it, too? Blech.